The preservative powers of the Newtown Creek. As mentioned yesterday, one headed over to industrial Maspeth the other night to do some shooting. 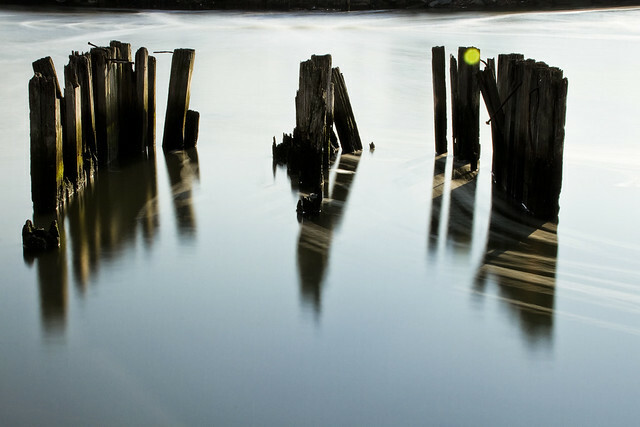 Those wooden piles you see in the shot above are the last mortal remains of the Maspeth Avenue Plank Road which have somehow survived the 143 years since they supported a bridge across the water here. It sounds impossible, I know, but these same piles are depicted in lithographic illustrations offered by the Harper’s Weekly publication in the 1880’s. They also turn up in historic photos of the Newtown Creek I’ve seen that were captured in the 1930’s. The hot weather tends to starve water bodies of oxygen saturation as a rule, and in the sewage choked Newtown Creek it’s a serious issue. Fish who find their way into the back channels of this tepid waterway are known to suffocate. Untreated sewage is released into the water via NYC’s combined sewer system, which sees sanitary and storm water flow through the same pipes. During rainy weather, the outfalls from the combined system belch out millions of gallons of waste water. This outfall water is teeming with bacteria which greedily consume all the oxygen they can. To address this problem, the NYC DEP has installed an aeration system (essentially a gigantic aquarium bubble wand) into the water column. This is problematic, as it aerosolizes sewage bacteria onto the breeze, and carries bottom sediments up to the surface. 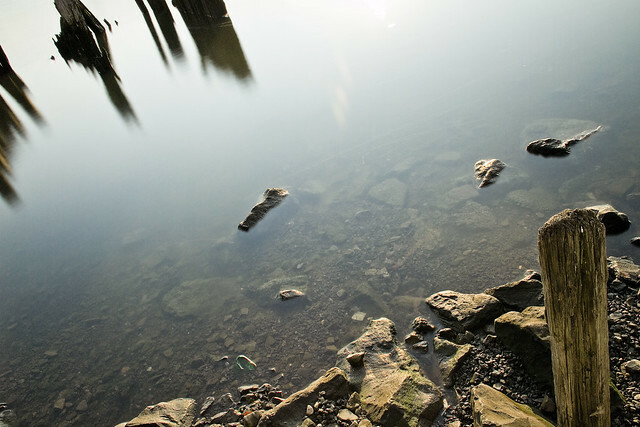 The bottom sediments, referred to as “black mayonnaise,” are why the Federal Environmental Protection Agency added Newtown Creek to the Superfund list in 2010. 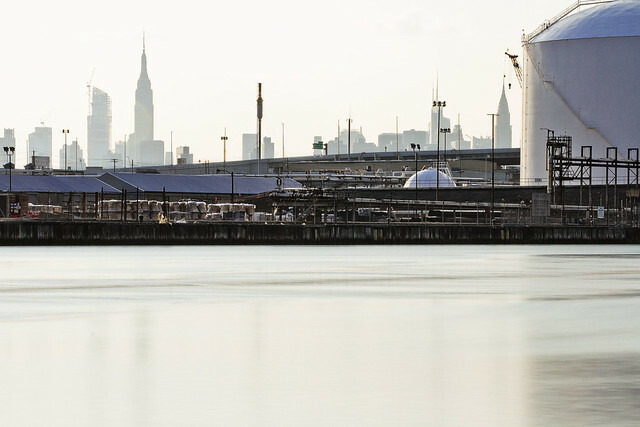 Across the water from the Maspeth Plank Road, you’ll notice the enormous 115 square acre National Grid LNG facility. It used to be a manufactured gas plant, opened in 1929 by the Brooklyn Union Gas company after they closed up similar facilities which were once found along the Gowanus Canal. The BUG plant at Newtown Creek manufactured 200 million cubic feet of gas a day, supplying the energy needs of Brooklyn and parts of Queens. The waste products produced by the process included a witch’s brew of chemicals referred to as an “ammoniacal liquor,” concentrated cyanide compounds which were called “blue betty,” and coal tar. Lots and lots of coal tar. Prior to the passage of the Federal Clean Water act, there was absolutely no reason for BUG not to dispose of these waste products directly into the water. The Black Mayonnaise sediment bed mentioned above contains significant amounts of coal tar, and according to some of the scientists studying the Creek as part of the Superfund process, there’s an 18 foot high ridge of the stuff piled up along National Grid’s bulkheads. What’s that green circle on the top of the piling on the right? But why’s it green? Do you use a lens shade? I’d retouch it out. Easy to do.